8th November 2017, New Delhi: As the Government celebrates Anti-Black Money Day after 1 year of Demonetisation, many are still questioning the effectiveness of demonetisation as almost all of the unaccounted money came back. The supporters of demonetization though believe that the exercise has led to an audit trail which can be effectively used in the future to scrutinize and investigate accounts being used for black money transactions. 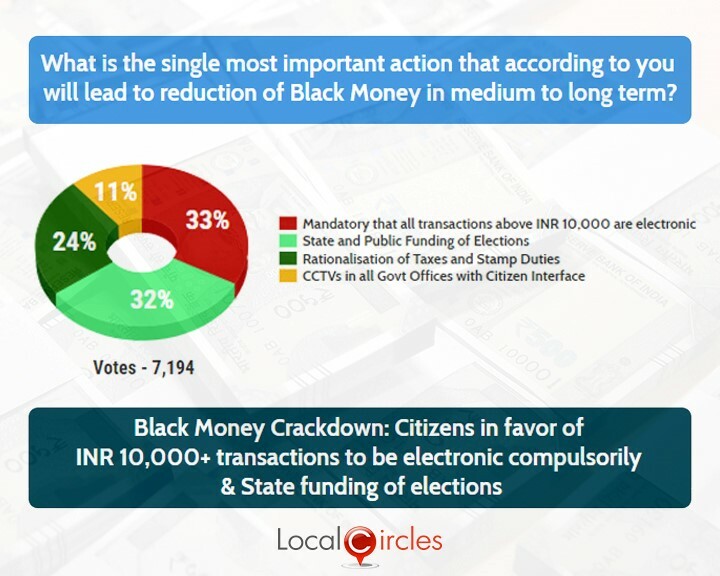 On the first anniversary of demonetisation, LocalCircles conducted detailed polls to get citizen perspective on state of things, what is needed next to address the menace of black money and how confident they feel about Government’s ability to recover Indian black money stashed abroad. The polls received more than 28,000 responses from over 200 Indian cities. 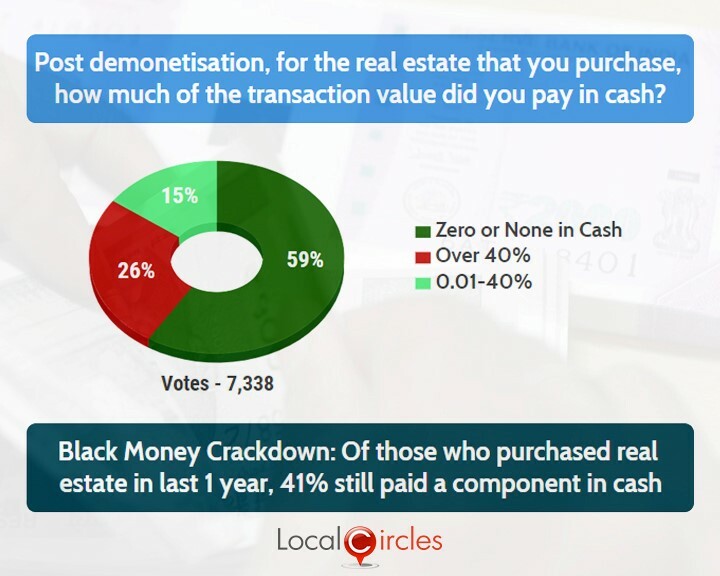 The first poll asked citizens post demonetisation, in the last one year if their family/friends had purchased real estate, how much of the transaction value did they pay in cash. 15% said they paid up to 40% in cash, 26% said they paid over 40% in cash and 59% said they did not have to pay anything in cash. This means that out of those who purchased real estate in last 1 year, 41% still paid a component in cash. Post demonetisation, the real estate sector showed a downward trend and many builders went into distress citing a cash crunch. But as the money flowed back into the system, cash transactions picked up, the real estate rates sky-rocketed again and everything went back to normal. The second poll asked what was the single most important action that will lead to a reduction of black money in India in medium to long term. 32% responded saying it was state and public funding for elections, 11% said it was CCTVs in all government offices with citizen interface, 33% citizens were in favor of Rs. 10,000+ transactions to be electronic compulsorily and 24% said rationalization of taxation and stamp duty will be an important step. Reforms in the electoral funding have been long pending and are much needed to reduce the generation and usage of black money during elections. According to citizens, a mechanism is needed where the Government, Citizens and Corporates can become the primary source of organized electoral funding and stronger enforcement by election commission to ensure parties and candidates are not spending beyond the permissible amount can play a key role in reducing the need for black money in the system. According to citizens, mandating all transactions above Rs. 10,000 to be done electronically will also ensure that all high-value transactions can be tracked and the cash transactions involving real estate deals will be substantially reduced. 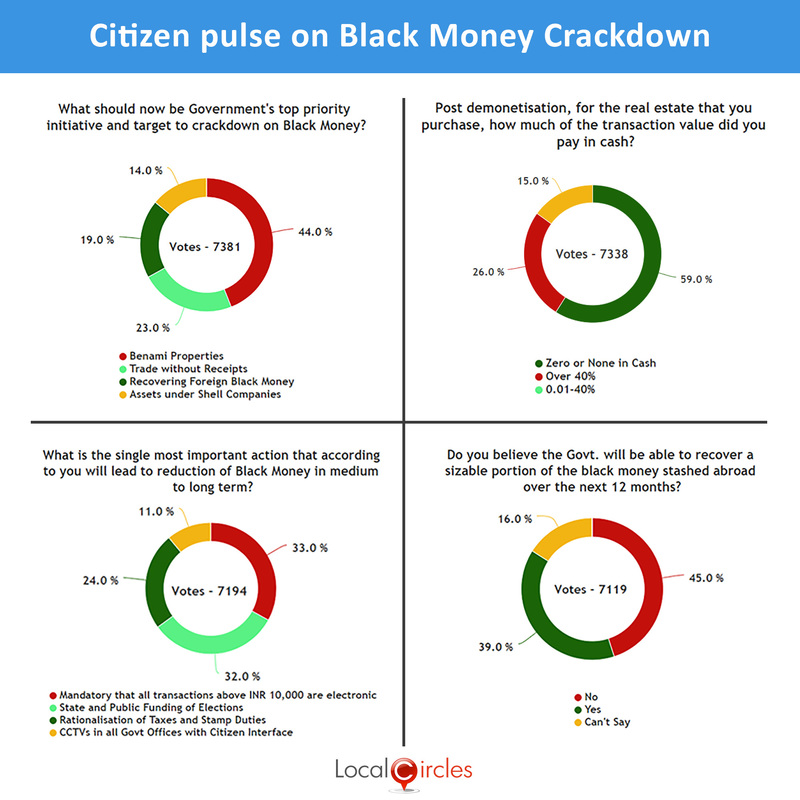 In the next poll, citizens were asked if they believed that the government will be able to recover a sizable portion of the black money stashed abroad over the next 12 months, and the majority believed that the government will not be able to do it. Only 38% were hopeful that it would happen and responded in an affirmative whereas 45% thought it could not be done and hence responded in a negative. 16% said they were unsure about it. The Indian government had signed the Tax Information Exchange Agreement (TIEA) with 13 countries to curb black money and had also requested the Swiss government to hand over bank details of all Indians having unaccounted money in Swiss banks. The government has shown an aggressive intent in recovering black money stashed abroad but have not been able to convert the intent into on-ground action. The last question asked citizens what should now be government’s top priority initiative and target to crackdown on black money. 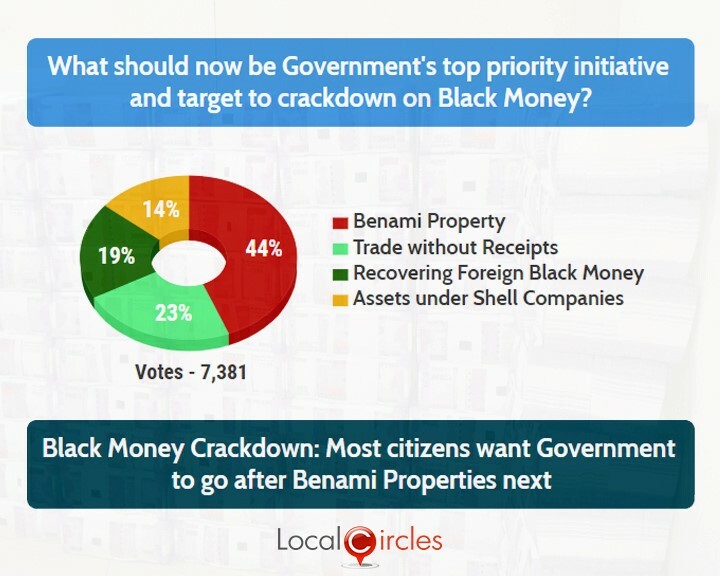 In response, 44% citizens said the government should go after benami property next, 14% said they should target assets under shell companies, 19% said concentration should be on recovering foreign black money and 23% said trade without receipts should be targeted. The government has already started a crackdown on shell companies and the names of as many as 2.24 lakh companies have been struck off the list. Reports have also revealed large stashes of black money in tax havens like Panama and Switzerland and most recently a list of 700 Indian entities has been identified from the Paradise Papers in the Caribbean, but in the mind of citizens, doubts remain whether the Government will be able to bring any of this money back to the country over the next 12 months. Citizens also suggested various ways in which black money in the economy can be reduced. These included putting all CA firms associated with any shell company transactions under the lens, cracking down on the sale of goods without invoices, monitoring cash payments of credit card bills, eCommerce deliveries, incentivizing electronic payments and introducing smarter amnesty schemes to allow people to convert their black money into white by paying a certain percentage as fine.